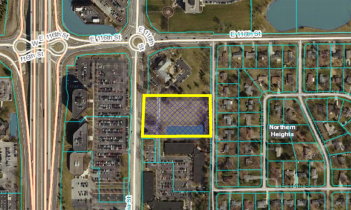 A national multi-family community developer and management company is planning to move its headquarters to Carmel. S.C. Bodner has filed plans with the city to build a three-story office building on 3.76 acres at 11505 N. Pennsylvania St. The 37,000-square-foot building is planned to house the S.C. Bodner headquarters, which are currently on W. 62nd St. in Indianapolis, and provide space for other tenants. Steven C. Bodner, third-generation president of the company founded in 1924 by his grandfather, said he selected Carmel because of its proximity to major interstates and amenities in Carmel. “We thought we’d build a building in Carmel and use (its location) as a recruiting tool for additional employees and make it a little more convenient for our existing population,” Bodner said, adding that he lives in Carmel near the site. The new building is expected to include a rooftop lounge, outdoor patios and other amenities. “It’s going to be one of the coolest new buildings in Carmel,” Bodner said. S.C. Bodner employs approximately 55 people, with more than a dozen based in Indianapolis. Bodner said he wants to double the number of employees working out of headquarters after the Carmel building is complete. If approved by the city, construction is expected to begin this fall or in the spring of 2018 and last approximately nine months. S.C. Bodner has completed approximately 6,000 apartment units in 15 states during Steven Bodner’s tenure. The company developed the Mohawk Hills (now Gramercy) apartments in Carmel and Meridian Towers East and West and Eagle Creek Apartments in Indianapolis, but it hasn’t completed projects locally for many years. The Carmel Plan Commission is set to discuss the project at its 7 p.m. meeting Sept. 18 at City Hall. Should it be 2019 instead of 2018?